Want a free ebook? Smashwords is running a promotion through March 8th. 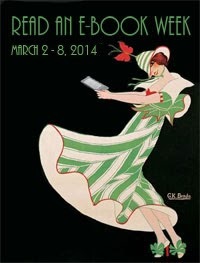 Called Read an ebook Week, you can go to their site, https://www.smashwords.com/books/category/1/newest/1 and start browsing. I have my book up on the site so look for A New Start, the first book in my Gulliver Station series. It’s free and please feel free to pass the word. It only lasts this week, so hurry! I have been sending my short story, Where The Brown Things Are, around to different magazines. The magazine Clarkesworld (a science fiction and fantasy magazine) rejected it Saturday morning. I immediately sent it to Asimov’s Science Fiction magazine. Who knows, someone may want to publish it. Arizona finally received some rain on Saturday. Not as much as forecast but we were all happy to see it. It’s been so warm and dry here that my daffodils, peach, and nectarine trees are blooming. I’m hoping we don’t get snow; that will kill the buds on the fruit trees. My anniversary is March 8th. We’ll be married 34 years. Oh my! We’ve come a long way since then. Go ahead and sign up for my newsletter where you’ll get first dibs on any promotions, book announcements, and other information. Go to the button on the right side of the blog or go to my Newsletter tab to sign up. Or sign up here. Use Control, Click to access the link. This entry was posted in Author, Book Release, Connie Cockrell, Gardening, Promotions and tagged Book for Sale, Free, Gardening, Life, Novel, Promotions, SciFi by conniejean. Bookmark the permalink. Until Saturday, use the code RW100 to get A New Start free on the link above.